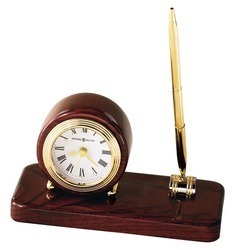 We are engaged in manufacturing and exporting quality assured Wooden Desk Clock With Pen. We manufacture these wooden table tops by making use of best grade timber and other requisite raw material. Further, by using modern machinery, we shape these wooden table tops to ensure their perfect design and smooth edges. We are betrothed in offering Wooden Table Clock. Our products are made under the guidance of skillful experts in compliance with worldwide industry norms. Our eminent company is presenting for our clients a vast range of Wooden Table Clock. These products are offered in different sizes and designs to meet the varied demands of our customers. Offered clocks are checked by our quality controllers before the final delivery to the market. VA- 031 Wooden Table Clock Digital Photo. Wooden table clock in Golden Finish. Deck up your drawing room table with its simplicity of design. - Makes a lovely gift for just about anyone.. and that can be YOU yourself! - The clock diameter is 8 cms. Wooden Table Clocks Manufacturers, Suppliers and Distributors in Delhi Gurgaon and noida. We also supply all over India and Metro cities like Mumbai, Bangalore, Chennai, ludhiana , Pune, Faridabad, Kerala. Our organization is amongst the prominent manufacturer and supplier of premium quality range of Table Clock Rose Wood Base. 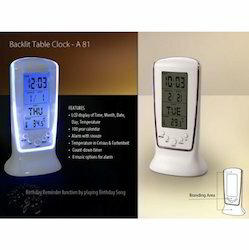 These table clocks are very reliable and sturdy made for supporting surface tables made from glasses, woods, etc. We are a Prominent & Leading Manufacturer, Exporter & Supplier from New Delhi, we offer Wooden Table Clock Memo Holder Items such as Wooden Designed table Clock, Wooden Table antique Gifts and Wooden Table Memo Holder. We are offering Make your office desk, children's desk and computer table look fantastic with this "Wooden Table Clock with Ashoka Pillar and National Flag" . it reflects the importance of National Flags in our life. Each piece reflects the artistic qualities and time one has taken to shape these appreciative decors. it makes for a perfect gifting option.